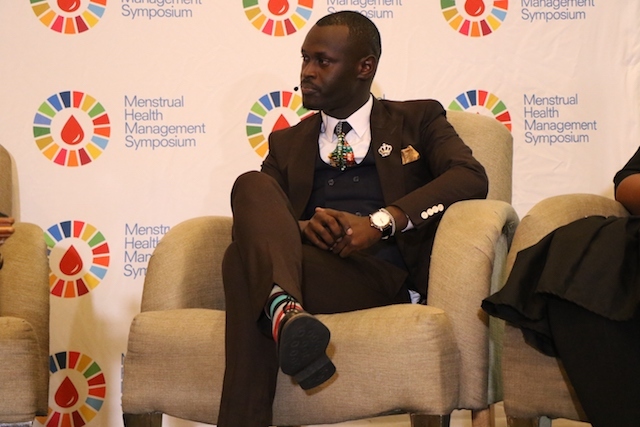 Kenyan Music Star and Entrepreneur Kennedy Ombima also known as King Kaka early last week bagged another first by being invited as one of the keynote speakers at the inaugural UNFPA East and Southern Africa symposium on menstrual health management held from the 28th to 29th of May 2018 at the Hilton, Sandton – Johannesburg. Among the elite list of speakers was Bathabile Dlamini, The Minister of Women – Government of South Africa and Dr. Julitta Onabanjo who is the Regional Director of UNFPA (The United Nations Population Fund). This was the first Menstrual Health Management Symposium and it was organized by UNFPA (The United Nations Population Fund), The Republic Of South Africa , UNICEF, WHO, Columbia University, UN Women and a few more selected partners. The two day event was attended by several international organizations working to create sustainable menstrual health management in the East and Southern Africa region. This was a very timely event for King Kaka and his team as they recently launched The King Kaka Sanitary Bank Campaign #BankOnMeKe (in February 2018), with an aim to provide sanitary towels to 100,000 school going girls in Kenya within 12 months and as at now they have already managed to distribute to 7,000 girls.